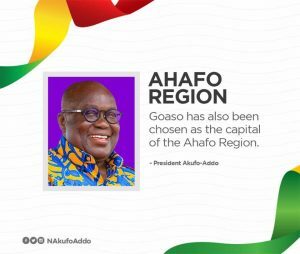 Goaso has been chosen as the capital of the newly created Ahafo Region. President BNana Addo Dankwa Akufo-Addo who made the announcement said 20,203 people attended the five public hearings conducted and those whop spoke at these hearings did so with a unanimity of voice, and were resolute in their conviction that the creation of Ahafo Region would accelerate the development of the area, and, thereby, result in an improvement in the quality of the lives of residents. He said the clamour for the re-organisation of administrative regions in our country has long, historical antecedents.